Journey Huey was not only late to school that the morning; she was also late to her own birthday party. Fortunately for Journey, a local sheriff saved the day. 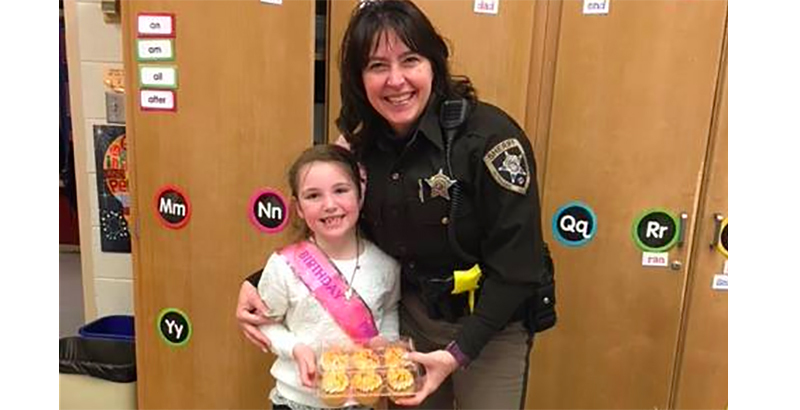 The 8-year-old had been so excited about her birthday that she stayed up past her bedtime to help her grandma make cupcakes for her classmates at Sugar Bush Elementary School in New London, Wisconsin. “My grandmother helped me, but I mostly did most of the work. There were 16 of them, and I made some flowers on them and stuff, with M&Ms and some sprinkles, and some frosting,” Journey told Fox-11. Unfortunately, her sweet treats never made it to school. On the way to school, she and her grandmother Hali were in a car accident. Deputy Sheriff Sue Bolwerk swiftly arrived at the scene and found Journey and her grandma unharmed. But the homemade cupcakes were smashed. A mother of three, Bolwerk knew how special birthdays can be, so when she saw Journey’s disappointment, she went beyond the call of duty: After escorting Journey to school, she went to the store, purchased 30 cupcakes, and brought them to the girl’s classroom. Bolwerk’s generosity not only rendered Journey speechless but brought grandma Hali to tears. 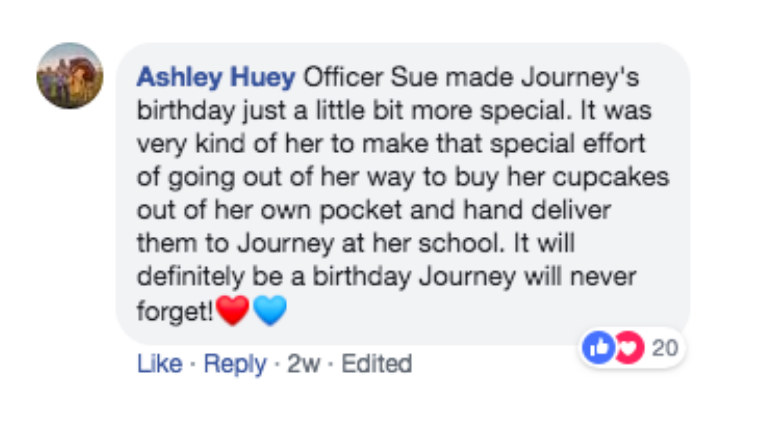 Journey’s other family members took to Facebook to express their appreciation for the deputy’s kindness. Journey’s birthday celebration was a success, and according to Fox-11, not a single cupcake went to waste.